Date Has Been Set, Mark Your Calendars for June 16, 2018! We sponsor this one day, youth based, professional style fishing tournament to introduce youth into fishing, promote family values and encourage families, friends and mentors to continue fishing and enjoying our great lake and community long after the tournament is over. We hope to create memories and relationships that will last a lifetime. Each year we are humbled by the young anglers with their fish tales, their excitement of fishing and their anticipation to ‘do it again next year’. Any donations will be used to cover the costs of scholarships, prizes, trophies, and food for the participants and volunteers. If you or your organization are interested in sponsorship or volunteer opportunities for the 2018 Green Lake Regional Angler Young Angler Fishing Tournament, please let us know. It promises to be another rewarding day! For further information or if you would like a personal presentation of the event contact Krista at Norton’s Dry Dock, 920-295-3462. Proved to Be A Great Success! The 2017 Green Lake AYA Tournament, held in June at Green Lake based out of Deacon Mills Park, was another great success! We are already looking forward to next year! 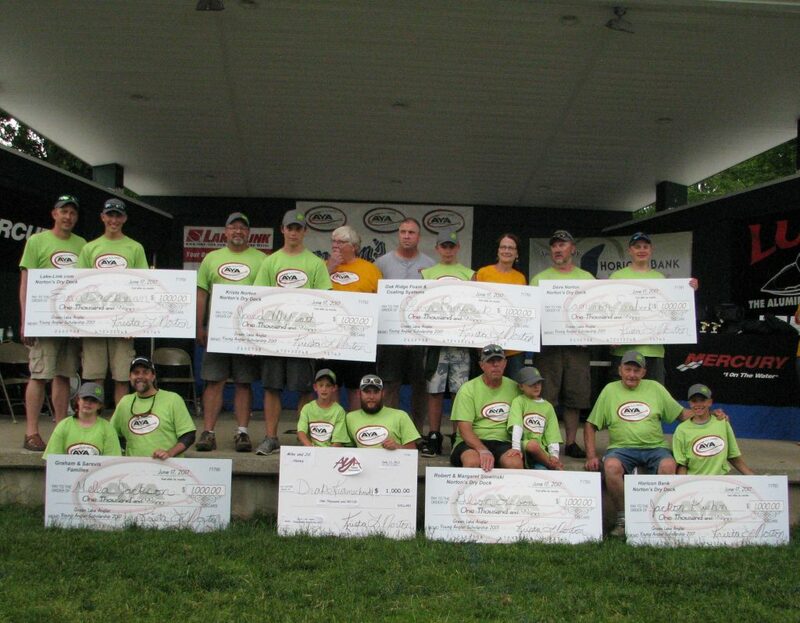 Each team consisted of one adult angler and up to two young anglers, 17 and under. From the 8:30 am blast-off to the 2:30 pm weigh-in, each young angler explored the water with their partners, in search of the right combination of 5 small mouth bass needed to take first place. To complete the day, the event ended with an awards presentation, made possible by donations from area and national sponsors. This years Stats: 50 teams participated; 90 Young Anglers fished, 191 Small Mouth Bass caught (and released), countless memories and stories that will last a lifetime. 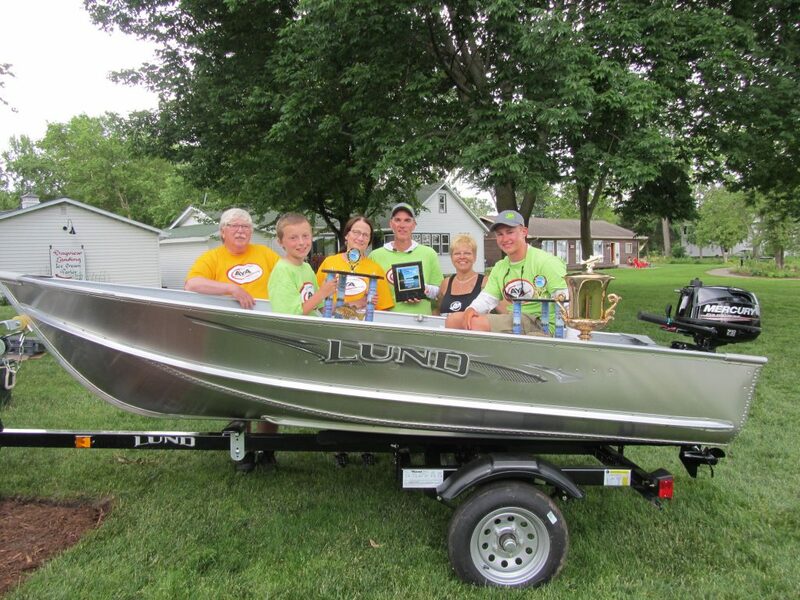 The 1st Place winning team (pictured below) went home with a Lund A -12 fishing boat powered by a 5HP Mercury 4 stroke outboard on a ShoreLandr’ trailer. 1st Place team – Team Bleser: Rich Bleser, Bailey Bleser and Justin Keeker. Winning with 5 fish, total weight 16.98 lbs! With the overwhelming response to our ‘Casting It Forward’ Scholarships, and the gracious generosity of others we were able to award eight lucky young anglers with $1,000 scholarships! (Bottom row left to right then standing.) Graham & Saravis Families Scholarship Recipient: Melea Jackson w/ Matt Jackson, Mike & Jill Havey Scholarship Recipient: Drake Kastenschmidt w/Makena Kastenschmidt, Robert & Margaret Slowinski Scholarship Recipient: Gilson Leben w/Dewayne Krause, Horicon Bank Scholarship Recipient: Jackson Kuehn w/ Bill Kuehn, Lake-Link.com Scholarship Recipient: Evan Baeckman w/ Doug Baeckman, Krista Norton Scholarship Recipient: Jared Milbrath w/ Allen Milbrath, Oak Ridge Foam & Coating Systems Scholarship Recipient: Oliver Parafiniuk w/ Stefan Jankowski, Dave Norton Scholarship Recipient: Cameron Scrabeck w/ Harry Bowey. Additional photos and highlights from the 2017 Green Lake AYA Tournament can be found on our Facebook page.